Cornea Problems - What Is a Corneal Abrasion? A corneal abrasion is a scratch on your eye. It can happen in an instant. You poke your eye or something gets trapped under your eyelid, like dirt or sand. Your eye hurts, and it doesn’t get better when you close it -- if you can keep it shut. Light makes it sting and burn. It’s actually on your cornea. That’s the clear layer that covers the iris, the colored part of your eye. It also shields the pupil -- the black circle in the middle of your eye. You may not feel symptoms right away. As a result, you may not be able to figure out what caused it. Gently rinse your eye out with clean water or a sterile saline solution. Don’t try to remove anything that’s stuck onto your cornea. Only a doctor should do that. If you still feel like something’s in your eye, see an eye doctor as soon as you can or go to the emergency room. The doctor will look at your eye and use a product called eye stain that lets him see the surface of your cornea. If something is on it or in it, he can safely remove it. Your doctor may prescribe antibiotic eyedrops or ointment to keep your eye from getting infected. He might also give you medicated eyedrops to ease pain and redness, along with pain medicine. She might tape your eye shut and have you wear a patch over your eye to keep light from bothering it. A minor scratch should heal on its own in 1 to 3 days. More severe abrasions may take longer. Don’t wear contacts until your eye doctor says it’s safe to do so. Wear sunglasses to ease discomfort caused by sunlight. You should fully recover from a minor scratch without permanent eye damage. But deep scratches can cause infections, scars, and other problems. If you don’t take care of them, they can lead to long-term vision problems. Report any unusual symptoms, including a return of pain after treatment, to your eye doctor. American Academy of Ophthalmology: "What Is Corneal Abrasion?" American Academy of Family Physicians: "Corneal Abrasions." 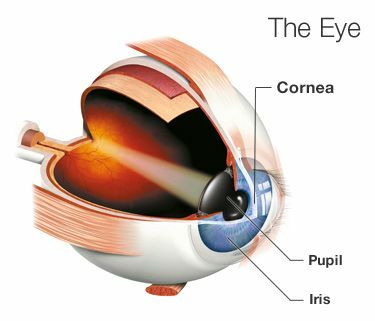 National Eye Institute: "Facts About The Cornea and Corneal Disease."